Tel Aviv, Israel, Tuesday March 7, 2017: Zest is tackling one of the most pervasive issues in the marketing world today: time wasted by sorting through a deluge of irrelevant, uninsightful content. Marketing content is a domain overflowing with clickbait titles, regurgitated articles, and as we all know too well, fake news. The way in which this content is distributed is equally dubious with easily manipulatable aggregators, majority-rule forums and the rise of native advertising. Now, more than ever, marketers struggle to consume information in the pursuit of knowledge. 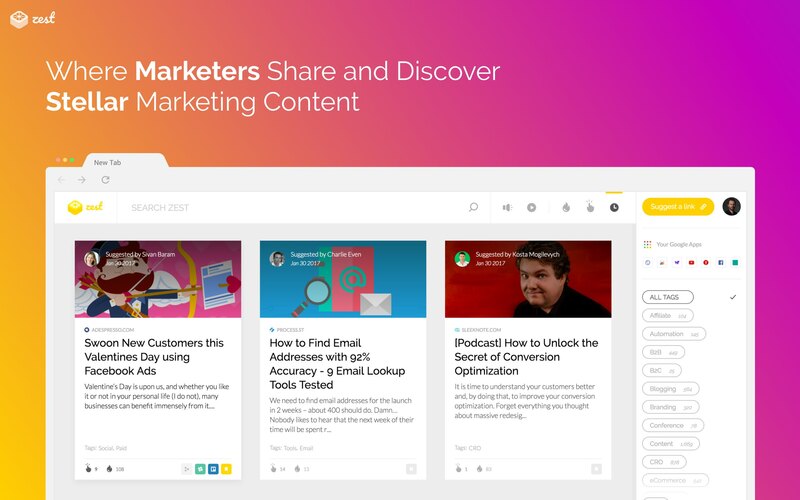 By installing Zest’s new-tab Chrome extension, marketers have access to fresh, insightful marketing content, carefully curated by established marketing experts. Before Zest, marketers spent hours every day, simply identifying - not even reading - content relevant for their respective niches. “Unlike existing options for marketing content curation, Zest took a new approach in solving this prevalent problem in our field. 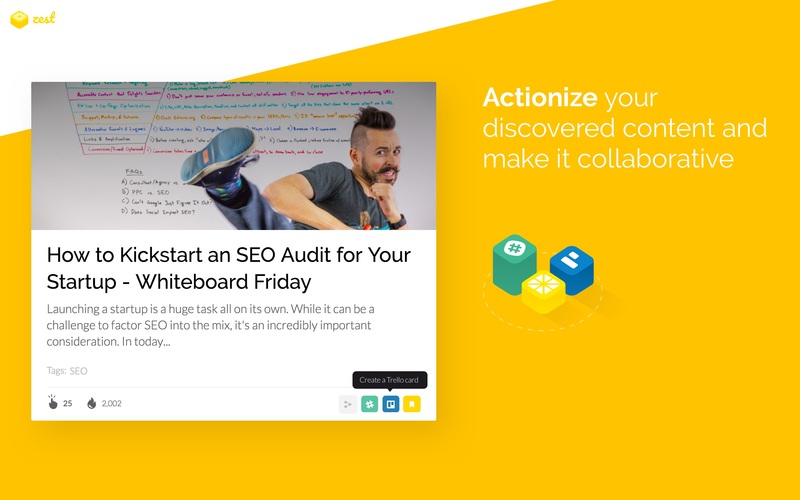 Our new-tab extension appears naturally in the workflow of every marketer with the opening of each additional tab; it doesn’t require visiting a community, relying on email, or participating in curation,” explains Yam Regev, CMO and Co-founder of Zest. By choosing to address a problem that reduces the friction in gaining new insights, the Zest community’s engagement is impressive with 2,000 weekly active users leading up to the official launch. This number was harnessed by the fact that marketers understand the value of easily identifying an actionable, in-depth read. As such, word of Zest has spread quickly spurring rapid growth, from a little over 100 users to more than 2000 in beta alone. Organizations and individuals interested in learning more about Zest can contact Yam Regev via email at yam@zest.is. Mr. Regev is also available for media interviews upon request.